Well, I've decided to yet again get off track of what I was doing and merge the entire game into one Trespasser level (or at least the terrain). While there have been projects like s1n31's Trespassing that port the terrain over to a different engine, I haven't seen anyone do a port of the entire island into a single TresEngine .wtd level, so I decided to give it a go. I currently do not have any screenshots but will have some tomorrow since I'm too tired to take some at the moment, but I'll describe my work as it stands right now. So far I've finished the entire island using retail BE, IJ, AS2 and SUM, Build 96 PV, LAB and AS1, and the pre-release versions of JR and IT. Additionally, before exporting from Max, I welded the levels together and roughed out the coast. 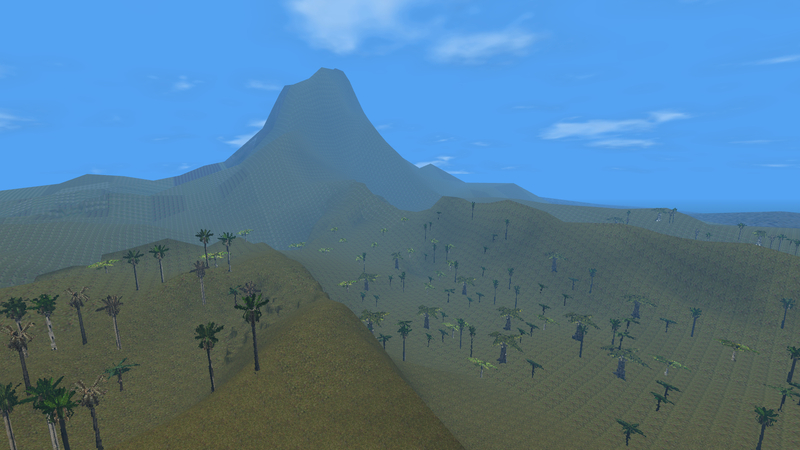 Now with a .wtd in TresEd, I plan to do the rest of the more detailed terrain work, which involves making the missing areas of the coast, fixing all the strange or obviously edited terrain, and optimizing it as much as possible. I'm also going to import most of the bigger general objects (large trees, some buildings and landmarks) from each level of B96 and see how the engine holds up. The level is currently a 8192x heightmap (the largest I've ever seen in Tres ) and is 100% stable except for the area around the rock jump from IJ due to the extremely high polycount of the stone steps and the surrounding area - CE has crashed there twice now, but some optimization to rendering and terrain mesh ought to do the trick. At the moment it's quite the spectacle just to fly to the untextured summit of Mount Watson and look over the poorly rendered and foggy island. I'm using the same fog and sky system as RTJP so the draw distance is very high and the sky can change color depending on the level, as in the regular game. Now, at the moment I'm very skeptical that importing the whole game into one level would work for two reasons: one being that the game simply might become unstable, especially with a map of this size, and two being that I think the combined object count of all the levels together might be above the 65something-thousand limit of Trespasser. Nonetheless I'm still going to do a bit of work with it, even as a base for others to expand on in the future. Think of this as more of a test of the engine than a real remake level as I don't really plan to take this to that point, especially since I have 3 other projects I'm more invested in (this is unrelated to my Beach remake). The only changes I'm going to make to the base shape of the island will likely be a roughing out of the Plantation House area and some terrain smoothing so that the different level elevations all play nice. Anyway, like I said, screens will be up tomorrow! I've spend all day on this so I have to hit the sack before I pass out from staring at tiny pink dots on my TV. I did this just a few weeks ago. It works fine in TresEd and CE. And I think it is totally possible to have all objects in it too, cause a lot of them can be combined in the end so they don't take up instance space. And I think it is totally possible to have all objects in it too, cause a lot of them can be combined in the end so they don't take up instance space. Hmm. That's quite possible. The levels themselves are quite messy when it comes to objects so you're probably right about that. If smaller objects that lack collision were made into big groups, it might be possible. But I still worry about level stability. Yep, getting this same problem too. 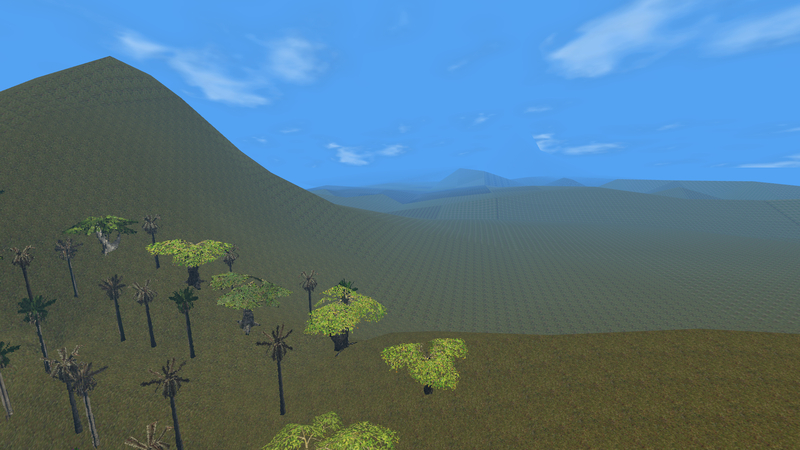 It seems as if the larger your terrain map gets, the worse TresEd becomes at terrain rendering. It's not so bad in open areas like JR or the valley in IJ, but like you said, some highly-detailed areas are really messed up. Already did something pretty much the same with Tres Reborn. While I didn't use your exact heightmap due to lack of importing terrain knowledge and the small size, I used it for elevation reference when carving out Sorna from scratch. 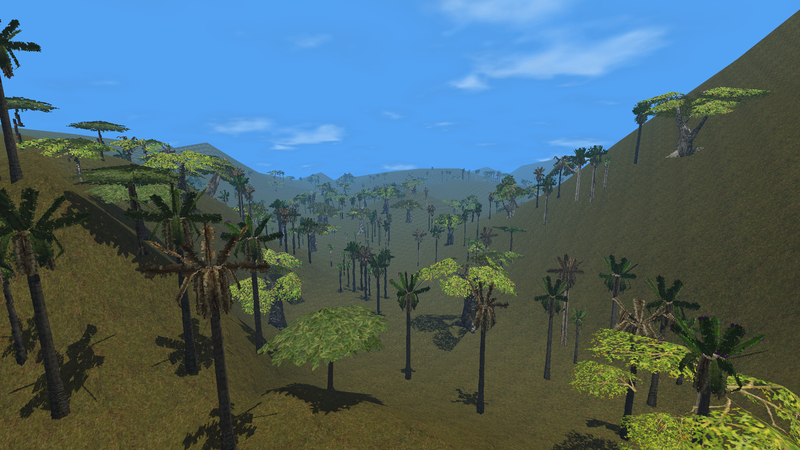 Oh, and here are those promised screenshots with some added foliage. From the Raptor encounter in Beach to Jungle Road. Mount Crick overlooking the area of PH. The Canyon and hills of IJ looking over the north of the island. The Plains and Dam area looking up to Mount Watson. You can see the valley from IJ behind the hills as you descend into Pine Valley. A smooth transition between Lab and Ascent 1. And finally, the view from where the dramatic music plays at the top of Mount Watson. Fortunately it turns out most of the levels use different instance numbers from each other, except for IT which uses some of the same instances as BE. The missing trees will have to be placed manually. Huh, good idea! I'll definitely give that a shot. 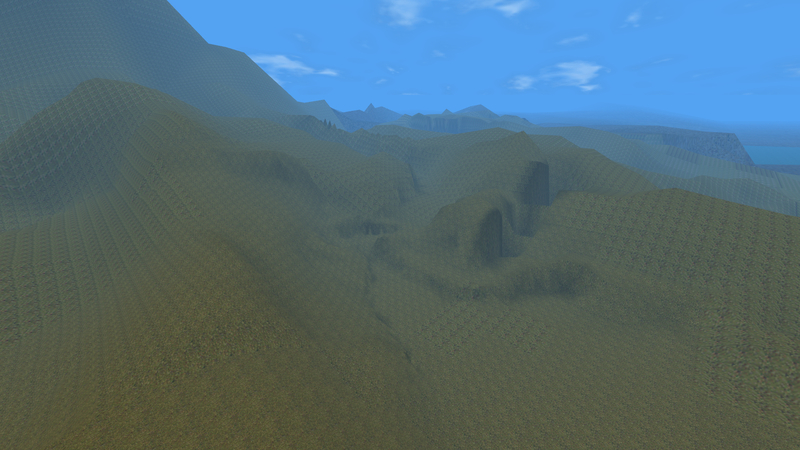 Pretty much just being lazy, I exported the terrain from StartLev so that was the texture it came with. I've just updated it with the B116 grass texture, and will start to add the appropriate other textures as I go (had to make a new palette that combines all of the levels together). PH will use the B96 IJ texture along with IJ and IT as well. I still have no idea to this day why you hate it so much! 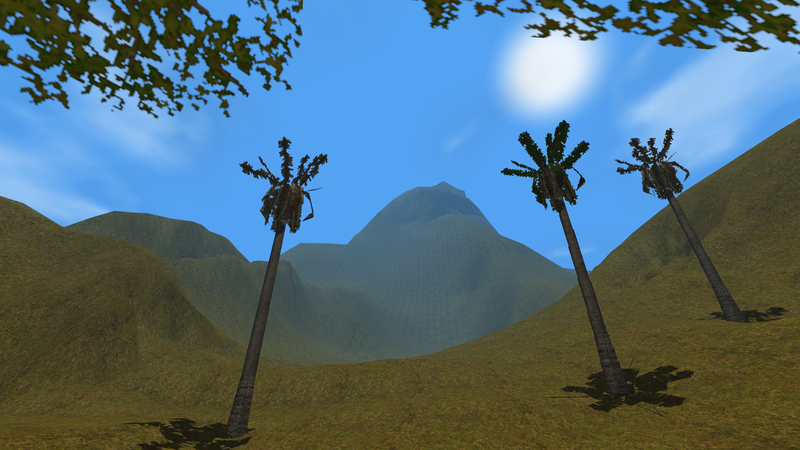 What are the errors (aside from glitchy terrain)? I stopped using it after Tres Reborn, but I'm just curious. 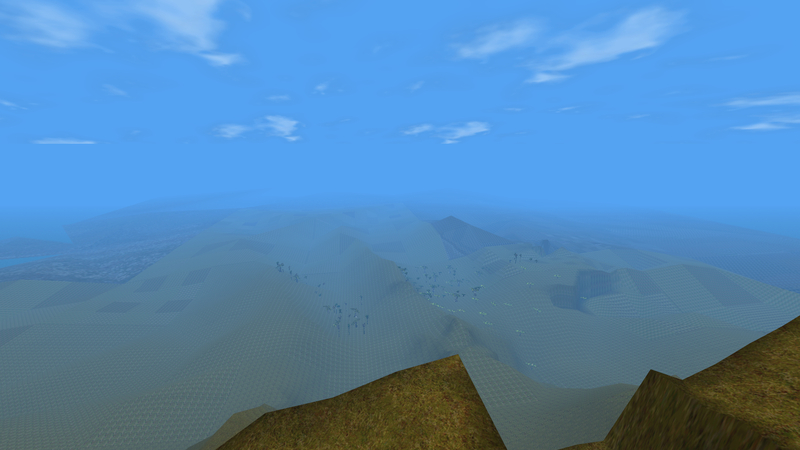 Durrr the glitchy terrain one... Well now my memory is a little fuzzy. The one which used the tc~river terrain is even more of a no-no... It has the Anne model which doesn't display HP on the heart tatoo. The newer one with the flattened retail terrain might have that error, too (which is the main reason I dislike my start level release(s). The more recent one is at least missing blood streaks because I briefly disbelieved in Trespasser's use of bloodstreaks. ^ Exactly. Though I do think a fixed version of the level itself is in order because I've seen a lot of fan levels that used StartLev as a base and ended up with the bugged heart tatoo. Interesting project, any developments on it. Objects wise? O_O Totally forgot you were doing this! Still doin it? Not really. I got some trees and the Dam into the level, as well as a few ground textures, but that's about it. I don't think this is honestly doable in Trespasser, especially since I think the object limit will be hit before all of the levels can be fully integrated. I might release the current state of the level though so people can at least check it out themselves as it is really cool to walk around in even in this stage.